The Group of 20 world leaders on Saturday committed to mobilizing resources to combat the Ebola epidemic that has killed some 5,000 people, but stopped short of agreeing to a global pandemic fund. The G20 issued a joint statement on the crisis, saying all members are "committed to do what is necessary to ensure the international effort can extinguish the outbreak and address its medium-term economic and humanitarian costs." Oxfam Australia Chief Executive Helen Szoke said a lack of urgency and specific commitments in the statement meant there was a real risk a UN target to treat 70 percent of cases by 1 December will not be met. "I think its reasonable that all of the G20 countries are explicit about what their financial commitment can be both in the short-term and the longer term," Szoke told Reuters. The World Bank, which has suggested the cost of the outbreak could rise as high as $30 billion, has proposed setting up a global pandemic emergency facility. World Bank Group President Jim Yong Kim said on Friday the idea of establishing a global emergency fund that could quickly respond to a health crisis had received interest from some leaders. Funds could be raised on the international bond markets and paid back over time, he said. The G20 statement called on both the World Bank and the International Monetary Fund (IMF) to explore new flexible mechanisms to address the economic effects of future comparable crises, but did not specify a particular approach. "This declaration lacks substance," said Friederike Röder, spokesman for the ONE organization, which campaigns against poverty and preventable disease, particularly in Africa. "Where are the concrete actions each G20 member states commits to in order to control the epidemic?" Oxfam and ONE said there is a desperate need for medical services and safe burials in three worst-affected countries: Sierra Leone, Guinea and Liberia. The United States, the IMF's biggest donor, is pressing the fund to write off some $100 million in debt owed by the three countries to support their economies and free up more money for government spending. US President Barack Obama addressed the crisis on Saturday, warning that "we cannot build a moat around our countries and we shouldn't try." Szoke said the G20 should commit to funding levels in its final communique due on Sunday. 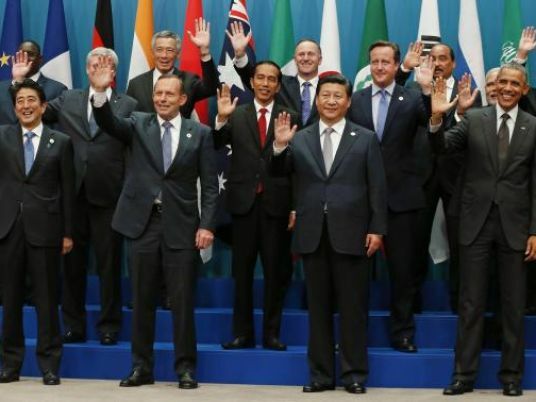 "There's still time for the G20 leaders to actually rise to the occasion," she said.